What is a NEEDeed Talk? It’s an event where we bring together our community of supporters, professionals, partners and of course, newcomers to learn what we’ve been up to as well as present upcoming opportunities with local non-profit organizations. The event provides an opportunity to learn about non profit work in Thailand as well as allows people to network and meet fellow like-minded professionals; those interested in using their skills for the benefit of local non-profit organizations. Unlike previous Talks, this upcoming event will be unique as we will not only be sharing what we have been up to recently, but instead of presenting upcoming NEEDeed opportunities, one of our partner non-profit organizations, WEDU, will be giving a presentation on one of their existing programs in which professionals can take part in. Wedu is a leadership development organization supporting female university students with innovative financing and inspiring mentorship programs. 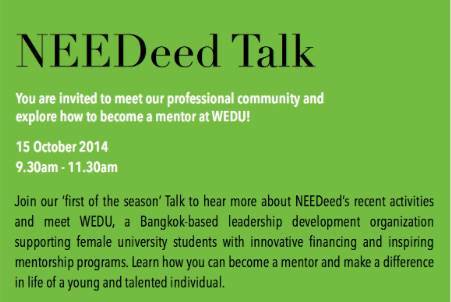 At the Talk, you will hear about WEDU`s mentorship program and explore how you can become a mentor and make a difference in the life of a talented, young individual.